California contains a myriad of beautiful hidden treasures buried within its varied landscape; with its abundance of mountains, lakes, waterfalls, and rivers, there are always things to do in this scenic state! One of California’s most amazing areas is the town of Groveland, CA; this charming spot provides a wide range of activities, from exploring the neighboring area of Yosemite to visiting the many cafes and shops downtown. Pine Mountain Lake is one extraordinary attraction found here that is a favorite spot of both locals and visitors alike. Its spacious land and incredible features create endless opportunities for fun in the great outdoors. Learn all about what Pine Mountain Lake has to offer and start making your plans to visit today! Tee off on one of the best greens around! The 18 hole championship golf course at Pine Mountain Lake is perfect for a lovely afternoon of golfing in California’s gorgeous weather. With well-maintained greens, challenging layout, and picturesque views, the Pine Mountain Lake golf course is any passionate golfer’s dream. Stop by their Golf Pro Shop for any gear you might need! The Pine Mountain Lake Campground, located about two miles from the lake itself, is an ideal spot for any avid outdoorsman. This area is comprised of a variety of walking and hiking trails, picnic areas, and cooking fireplaces. Horseshoe pits, volleyball courts, and tetherball is found here as well to entertain guests of all ages. These activities combined with the pleasant Pine Mountain Lake weather sets the ideal scene for an unforgettable experience. A body of water that spreads across 202 acres, Pine Mountain Lake has plenty of space for enjoying some time out on the water! You can choose from basking in the sun on the shores, taking a dip in the cool waters, or embarking on a float trip in a canoe or kayak. These are private amenities of Pine Mountain Lake, however, so a vehicle permit will have to be purchased for access. Stop by the Pine Mountain Lake Equestrian Center to visit their friendly horses! Go for trail rides, attend workshops, or even take classes with these experienced guides to learn more about the beloved sport of horseback riding. What better way to complete your exciting day in the great outdoors than a delicious bite to eat? The Grill at Pine Mountain Lake serves some of the tastiest dishes around that will satisfy even the hungriest appetite. Their outdoor patio is a fantastic place to sip a specialty cocktail after finishing your amazing meal. 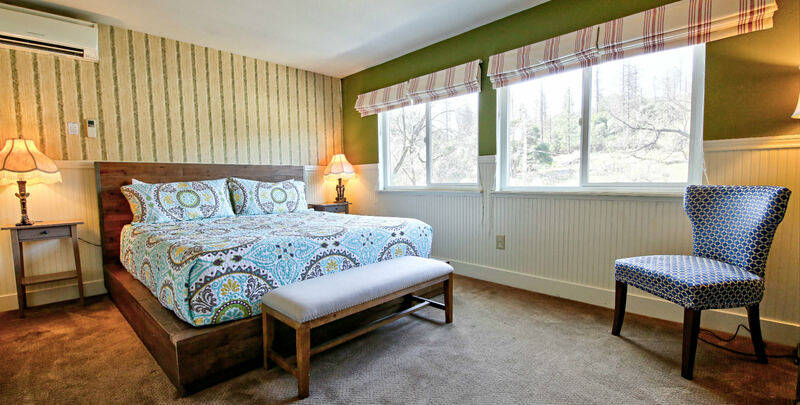 After an exciting day at Pine Mountain Lake, treat yourself to a stay in the most luxurious lodging possible! Hotel Charlotte is a historic bed and breakfast in Groveland, California, that offers comfortable furnishings and excellent amenities within a charming, rustic environment. Choose from staying in one of our twelve lovely rooms or renting one of our cozy vacation cottages. You can explore the many attractions of our surrounding area, or simply spend time unwinding in our relaxing environment; we have an elegant living room, friendly and helpful staff, and even our very own restaurant to accommodate all of your needs! Don’t wait another minute to start planning your dream vacation; check our availability and book your stay today!